Maryland residents looking for outdoor structures can consider an Amish-made barn, generally a quality, affordable option for storage building needs. While Maryland has its own Amish communities, its proximity to large Amish settlements in Pennsylvania areas such as Lancaster County assure a supply of Amish-made barns and other outdoor structures. A number of Amish barn sellers have arisen to serve residents of the Old Line State, including MD cities such as Baltimore, Columbia, Ellicot City, Germantown, Silver Spring, Waldorf, Dundalk, Glen Burnie, Salisbury, Frederick, as well as Washington D.C. and other MD locations. Amish Built Sheds & More is a Baltimore supplier for Amish crafted outdoor structures including gazebos, sheds and barns. All of their buildings come in a range of options including pressure treated joints, galvanized hardware, vinyl siding in a range of colors, and more. Twin Locust Barns features Amish quality built outdoor structures including mini-barns, big barns and horse barns. Amish-built two story big barns come with a broad selection of options such as indoor stairs, vinyl siding, overhead garage doors, optional door or windows on each end. Twin Locust Barns serves Pennsylvania, Maryland, Delaware, New Jersey, and New York communities. Twin Locust has two different locations, including in the Baltimore area and Hagerstown. Garden Spot Structures is located half an hour northeast of Baltimore. They offer a large selection of Amish-made structures such as sheds, garages, barns, pet structures, poolhouses and lawn accents. Barn styles include Liberty Dutch, Keystone Dutch, Classic, Quaker run-in horse barns and more. Wide selection of building options available. Amish Craft F & C Backyard Structures has provided Amish-made outdoor items since 1994. A Baltimore area dealer for Amish-crafted sheds, horse barns, garages, run-in-sheds and more. Creative Outdoor Sheds is located half an hour south of Baltimore. They provide a vast selection of Amish hand-built structures including mini-barns and Dutch barns, made from painted wood and vinyl. Broad choice of trim, door, floor, siding, shingles and shutter color options available. Amish Customs is a Frederick supplier for Amish made barns available in a range of options including barns with Dutch doors and center tack rooms, wood barns in brown stain, big modular horse barns with tack, wash and feed rooms, unstained cedar barns and much more. Each structure is built by Amish craftsmen. 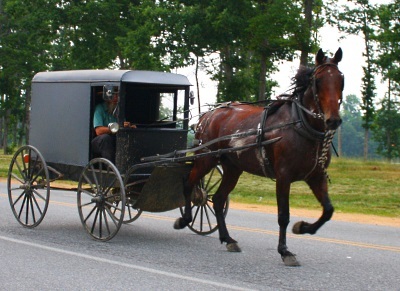 Amish Customs offers free delivery within 30 miles. TJ Farms is an East Maryland supplier of Amish-constructed buildings. TJ Farms carries a few different models of hand-built barns including mini-barns, storage barns, horse barns, Dutch barns. Each item can be customized to fit any needs. Located on the Delmarva Peninsula. Backyard Collections carries mostly Amish made products including custom made storage barns with your choice of siding colors, extra windows, flower boxes or doors. A Delmarva Peninsula dealer. Shed King is a Washington DC area supplier of Amish-built Heavy Duty mini-barns, big barns and pole barns. Best Built Barns & Sheds provides Amish-built mini-barns along with other outdoor items. Mini-barns come in a range of options such as cupolas, vents, shutters, flower boxes, pressure treated flooring, lofts and ramps. Each building comes in a broad choice of wood and vinyl colors (black, blue, tan, red, gray, chestnut,almond, blue, clay, white), asphalt shingle and shutter options. Best Built Barns & Sheds serves Washington, DC and surrounding areas. Please verify hours of Amish barn dealers given above. Business locations & hours can change. Amish-owned businesses are always closed on Sundays, while non-Amish barn dealers may be open. Not responsible for any changes to the above. Finding Amish structures in Maryland is not difficult. Amish mini-barn retailers offer a variety of models on-site which can be examined if you are looking for a particular variety of barn. Additionally, some provide online ordering and delivery. Some Amish barn buyers seek to purchase direct from an Amish source. As not all Amish sell their products retail, this does not always work. However, some do, and given the Amish presence within Maryland as well as proximity to Amish communities in other states (in particular Lancaster County and other areas of Pennsylvania), finding an Amish barn maker in an Amish settlement is one potential option. As of 2013, there are just 3 Amish settlements in Maryland. The largest and most well-established, by far, is that found in St. Mary’s County in the area of the town of Mechanicsville. St. Mary’s County, MD: Founded in the early 1940s, this community has grown to over 1,000 Amish residents in size. Amish here are active in agriculture and business, with the tell-tale windmills of dairy farms scattered amongst small at-home shops marked by modest roadside signs. A number of Amish manufacturers can be found in this community, including furniture makers. Located about an hour and 20 minutes from Baltimore and an hour south of the Washington DC area. Lancaster County, PA: One of the two largest Amish communities in North America. Numerous outdoor structures builders including Amish barn makers can be found in the sprawling settlement which stretches across much of eastern Lancaster County and into neighboring Chester County. A highly entrepreneurial Amish community lying in southeastern Pennsylvania. Please let me know where I can send you a drawing I made for a 10×12′ shed that I will use as studio space.